This PDF 1.0 document has been generated by OmniPage 12 http://www.scansoft.com, and has been sent on pdf-archive.com on 13/04/2016 at 14:47, from IP address 151.24.x.x. The current document download page has been viewed 287 times. File size: 12.9 MB (111 pages). the installing and removing procedures, refer to respective paragraphs describing each component . rear side of crankcase breather hose © . • Disconnect the PAIR hose 07 and coupler © . • Disconnect the cooling fan thermo-switch lead wire coupler . • Disconnect the radiator outlet hose . • Disconnect the reserve tank hose . • Remove the radiator mounting bolts . • Disconnect the radiator inlet hose . cooling fan coupler C2 . Be careful not to bent the radiator fin . • Loosen the No .1 (Front) cylinder exhaust pipe connector bolt . • Remove the No .1 (Front) cylinder exhaust pipe bolts O. • Loosen the No .2 (Rear) cylinder exhaust pipe connector bolt . • Remove the muffler mounting bolt and nut . • Remove the exhaust pipe mounting bolts and nut . • Remove the exhaust pipe/muffler . 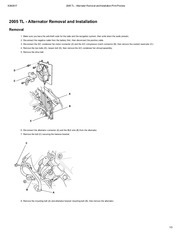 • Remove the engine sprocket cover 1~ . • Remove the gearshift lever OO . • Remove the clutch push rod © . • Remove the clutch cable from the generator cover . • Remove the engine sprocket nut O7 and lock washer . • Loosen the rear axle nut D .
• Loosen the left and right chain adjusters (Z .
chain has enough slack . • Disengage the drive chain with the rear sprocket . • Remove the engine sprocket 30 . • Remove the oil cooler . • Disconnect the oil pressure switch lead wire ® . 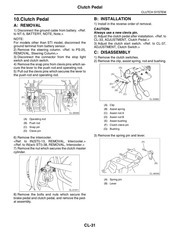 • Disconnect the starter motor lead wire ($) . • Disconnect the No .2 (Rear) spark plug cap © . • Disconnect the ECT sensor lead wire 70 . • Disconnect the No .1 (Front) spark plug cap 10 . • Disconnect the generator lead wire coupler (1 . • Disconnect the CKP sensor lead wire coupler ® . • Disconnect the clamp . • Disconnect the GP sensor lead wire coupler (5) . • Remove the side-stand switch lead wire coupler C) . • Support the engine using an engine jack . Do not support at the oil filter . This file has been shared by a user of PDF Archive. Document ID: 00359910.